As usual, this has been a busy week in the Eurasian borderlands. 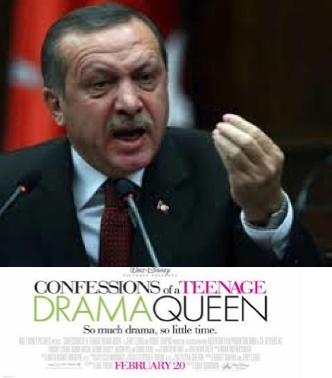 The big story, of course, has been the Turkish elections from last Sunday (jump down to see my take on them), with the (premature, in my view) celebrations of President Erdoğan's political detractors capturing much of the media attention surrounding Turkey over the past week. Personally, this week has been a really pleasant and interesting one as I've continued my travels through the Volga region of central Russia. I'm currently nursing a pulled muscle in my thigh as a result of some serious stair-climbing that I was involved with back in Nizhnii, as well as some very sore feet. That's okay, though--it's playoff time, and everyone is hurting. In any case, below are some photographs and comments about my trip, as well as my observations regarding events taking place now in Turkey. 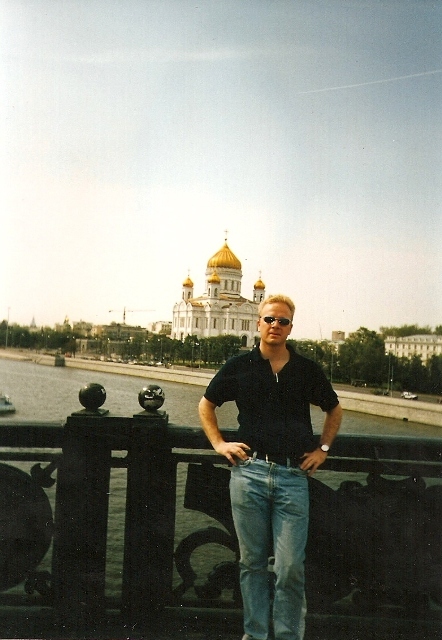 The second time I visited Russia was in 1998. I was living in Istanbul at the time, and had just taken the GRE in preparation for my planned application to MA programs that fall. On August 15, I headed out to Istanbul's Atatürk airport to take a one-way flight to Moscow for the princely sum of $100 on Onur Airlines (aka, "The flying minibus"). 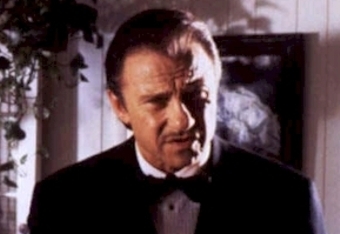 Whereas during my previous trip in 1993 I hadn't spoken any Russian, by 1998 I could speak a little bit. I'd been taking private lessons from a woman in my neighborhood in Istanbul for the previous couple of years. Although I would realize, upon arriving in Russia, that Tatiana (my teacher) was pretty much the only Russian person that I could understand, even with my very limited abilities at the time I found it much easier to get along than had been the case five years earlier. Back in those days, the only way to find out if your plane was leaving on time was to call the airport, which was generally an exercise in futility. So, I just showed up at the airport to board my 6 pm flight, only to be informed that we would be leaving four hours later. I tried to make the best of the situation, and sat around chatting with the other passengers in Russian, at least as best I could. Once we had finally arrived in Moscow and made it through customs, it was after midnight and the bus that I'd been planning on taking into town was no longer running. Then, as I tried to figure out what I was going to do next, I saw the lady who'd sat next to me on the plane, and with whom I had conversed a little bit toward the end of the flight. She'd been met by her husband and young son, and now they were asking me if I wanted a lift into town. What else could I say but "sure?" But not only did they drive me into town--they also took me on an impromptu tour of late-night Moscow. There was very little traffic on the streets, and my hosts made a point of taking me alongside the Moscow River to show me how the Kremlin and other buildings were lit up. It was a gorgeous and great experience. I was reminded of this the other day when, upon returning to the apartment where I was staying in Nizhnii, my hosts asked me if I wanted to take a night drive with them. You can see all of the illuminated buildings, they said. It'll be pretty. Once again, I said "sure," and placed the beer that I'd been preparing to crack open back inside the fridge. 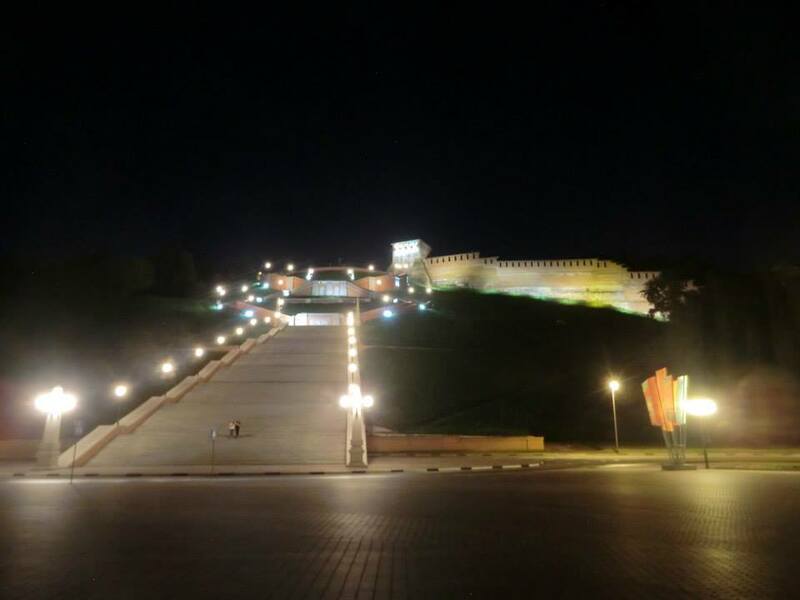 Nizhnii may not be Moscow, but it's still a really attractive city, especially at night. 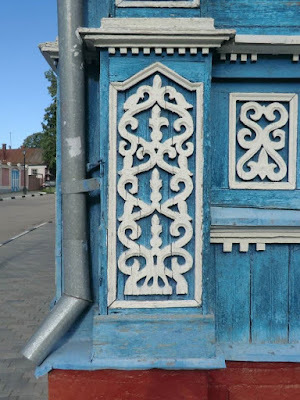 While Yulia drove and pointed out the sites to me, her husband Eduard kept up a steady narrative regarding the history of what we were seeing. It was a great time, and the kind of experience that's facilitated by staying in someone's house, as opposed to a hotel. To be honest, it's the sort of thing that I think I was kind of looking for when I decided to take this trip. Friday and Saturday of last week were my last days in Nizhnii. While I'm making a point of trying to do some academic writing every day, I also did a fair bit of tourism. The people on the boat also reminded me of earlier times. A couple of ladies saw me sitting by myself and asked me to come over and join them. At the end of the trip, one of the people working on the boat asked me if I wanted to go to church on Sunday. 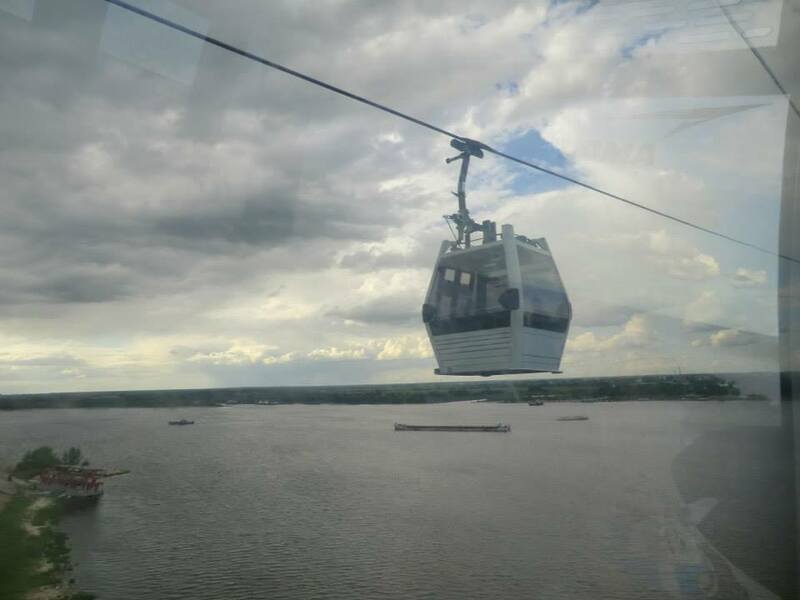 Later on Friday I took a cable-car ride over the Volga--a fun if somewhat terrifying trip. People in Nizhnii use it as public transportation, and were as blasé about the trip over this enormous river as commuters in Istanbul are when they take boats from one continent to another. 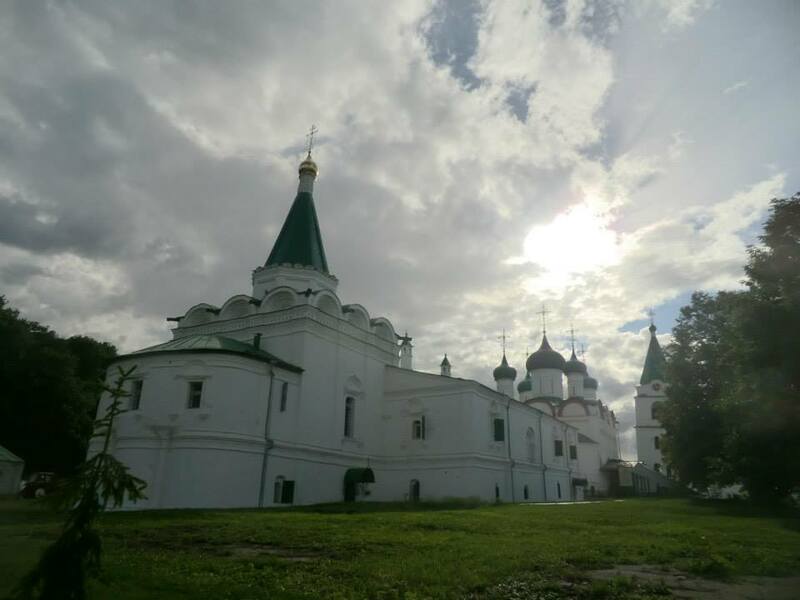 After the cable-car trip across the river and back, I went over to the Pechersky monastery, which is next door to the cable-car station. The next day, Saturday, I visited Gorodets, a small town located a couple of hours' drive from Nizhnii. 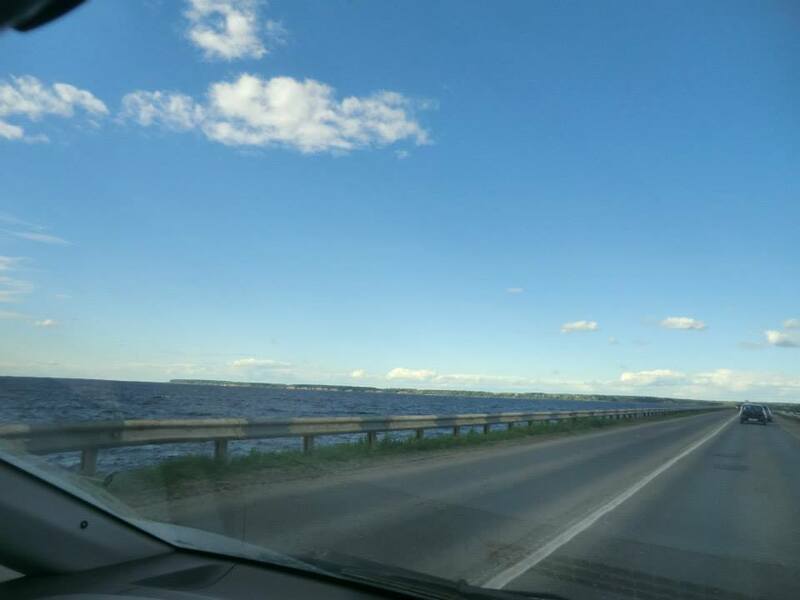 I went with Eduard, and on the way there we drove for a stretch along the Volga, which opened up as if it were a lake in some spots. Eduard and I walked around the old town for a while, checking out the attractive old houses there. I'd seen a fair bit of architecture like this when visiting the "Golden Circle" surrounding Moscow in 1998, but hadn't spent much time in a place like this in Russia since then. In the evening, I took a bus back to Nizhnii on my own, as Eduard was going to visit his mother's nearby dacha. I then spent the evening writing and getting ready for my trip to Kazan the next morning. There's something about the light in central Russia--especially in summer--that's truly amazing, and which causes me to take snap after snap of the same objects. The sun is bright, and reflects beautifully off the domes of churches. In the background, meanwhile, there are often foreboding rainclouds. It's kind of a silly cliché, I know, but still--I guess that's one reason, at least, why I can't resist taking so many photos whenever I'm in this country. In any case, more photos from Nizhnii and Gorodets can be found in this album in the Borderlands Lounge. The day of my departure for Kazan coincided with the holding of parliamentary elections in Turkey. The big story was that, while the ruling AKP party still got the most votes at 41%, they lost their majority in parliament. This is important mainly because President Tayyip Erdoğan had been hoping to gain a "super-majority" that would allow the AKP to call a referendum putting new powers into the hands of the president. A lot of my Kemalist friends are celebrating right now--and with good reason--but AKP's election setback doesn't mean that Erdoğan won't get the powers he covets. You need 330 votes in parliament to schedule a referendum. If the AKP makes a coalition with the MHP (Nationalist Action Party), they would likely just be a vote or two shy of getting the necessary votes in parliament. It would be a real stretch--because it seems difficult to believe that anyone from the Kemalist CHP or Kurdish-oriented HDP would lend any support to an MHP-AKP alliance, but stranger things have happened. You can't rule anything out. It's also worth noting that, even though the AKP received just over 40% of the vote in an election involving several parties, in a straight up yes-or-no vote on a referendum to create a presidential system giving Erdoğan more powers, the 'yes' side could conceivably do much better. This would be especially the case if, as was the last time a referendum was held that strengthened the AKP's powers (allowing them to pack the Constitutional Court with their own appointees), the referendum question were paired alongside more popular measures. In the case of the last referendum, this meant also including a measure allowing for Turkey's 1980 coup leaders to be brought to trial. So, in the words of the Wolf, let's not start...well, you know what I mean. 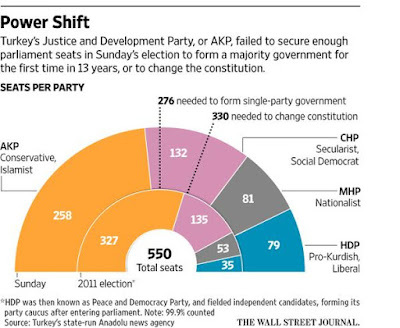 All of the above notwithstanding, this was a pretty big defeat for the AKP. 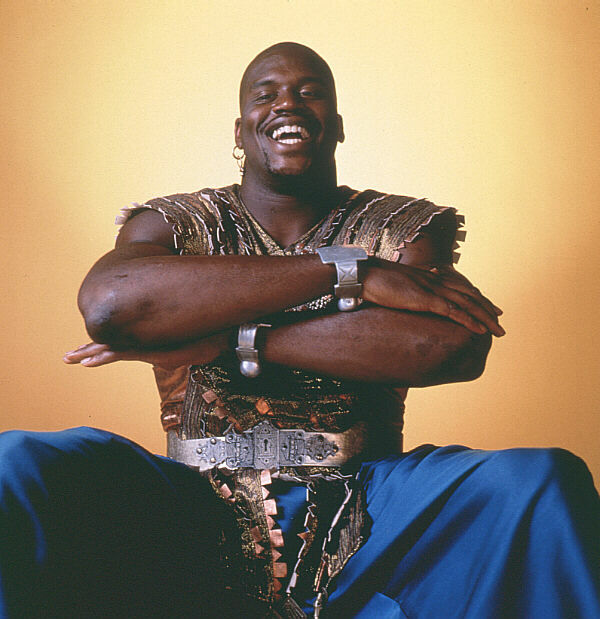 I didn't find it terribly surprising, though. The AKP, just like every other party in Turkey, is one person's party. Once Erdoğan left parliament and the prime ministry to become Turkey's president, leaving the party in the hands of current PM Ahmet Davutoğlu, it seemed pretty clear that the AKP would be headed toward some sort of diminution in their vote tallies. Look at what happened to ANAP once Turgut Özal became president, or at the electoral fortunes of the True Path Party after Suleyman Demirel's elevation to the presidency. In both of those cases, too, the support of these parties shrank consistently once the leader they were primarily associated with moved on to the presidency and stopped being the leader of the party. Özal, Demirel, Erdoğan: they all thought that their parties would survive without them, but none of them built a lasting institution. Instead, their parties are all basically movements built around one person. 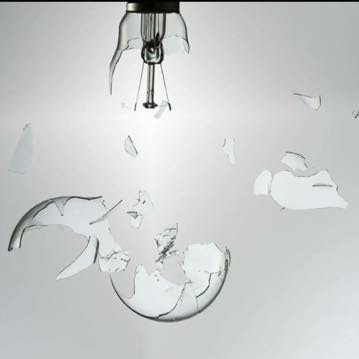 Once a party-leading prime minister leaves "active politics" and becomes president (which is a position that is supposedly above politics in Turkey but which Erdoğan had hoped to--still hopes to--transform into an American-style presidency), the parties always begin to shrivel up. Indeed, if the AKP doesn't manage to cobble together some sort of bizarre coalition involving both Turkish nationalists and Kurdish rights supporters (which seems very difficult), Erdoğan's ascendance to the presidency will likely end up being seen as the worst thing that ever happened to the AKP. But I think people are perhaps writing Erdoğan's political obituary a little too soon. Looking at my FB feed this week, I saw a lot of "now our era of fear and hatred is over" type sentiment written on people's walls. Well, maybe, but I think it's worth remembering that there actually was a lot of fear and hatred taking place in Turkish politics prior to Erdoğan: it was just that the Kemalist and Gezi-types usually weren't the ones feeling the back end of it. Indeed, it was thanks largely to the nasty nature of pre-AKP Turkish politics that Erdoğan managed to create such a potent political movement in the first place. So maybe a bit less triumphalism and a bit more humility and honesty regarding what it was that originally brought Erdoğan to power would be in order here. But yeah--I'm not really holding my breath in anticipation of this. Yes, folks have grown weary of his antics, but the resentment toward Turkey's pre-AKP political system that Erdoğan has managed to play upon was, and is, very real. 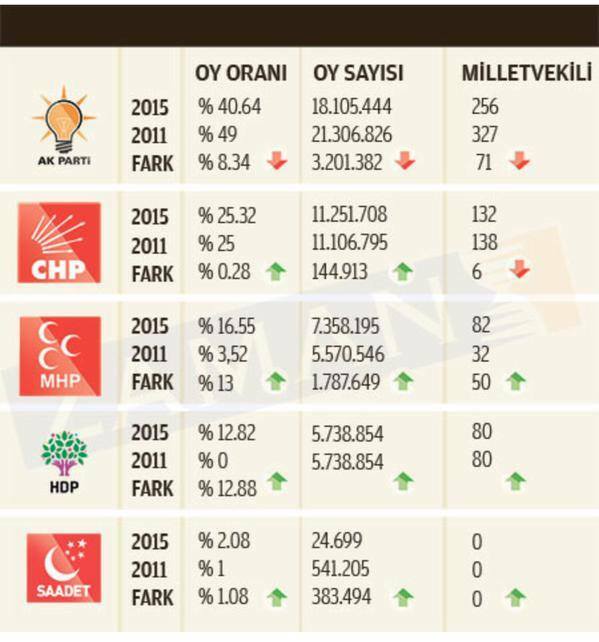 This election was lost by the AKP, rather than won by the main opposition (Kemalist) CHP. Had Erdoğan never left parliament, the AKP would likely be putting together its fourth-straight majority government right now. In fact, if you look at the results for all of the parties, it's pretty clear that the big winners were not the main opposition CHP--their share of the vote was pretty much unchanged from 2011--but rather the Kurdish-oriented HDP and the nationalist MHP. 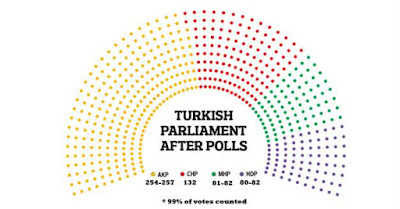 The HDP's leader, Selahattin Demirtaş, did a great job of extending his party's appeal beyond Kurds, but I think that a lot of anti-AKP voters cast their ballots for the HDP mainly as a way of getting the party over the 10% threshold required for a party to enter parliament. 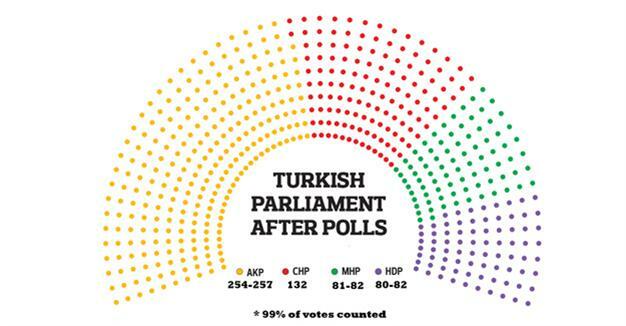 Had the HDP not gotten over 10%, their votes would have been redistributed proportionally among the remaining parties, an eventuality that would have primarily benefited the AKP. What remains to be seen now is what happens with the talks about forming a coalition government or, alternatively, a minority AKP government that would be supported on confidence votes by another party. The leaders of the CHP, MHP and HDP have all said that they won't form a government with the AKP. We'll see about that. While I would be surprised to see the CHP work with the AKP, I could envision either the MHP or the HDP doing so, especially if the AKP gives them what they want. While Erdoğan's detractors celebrate on Facebook and elsewhere, they should keep in mind that there's still a lot of time left on the clock. Erdoğan is a far shrewder--and much more ruthless--politician than most of his rivals. He won't give up on his dreams of creating an American-style presidential system--with himself holding the reins of power--without first putting up a fight. So stay tuned--there's definitely a lot more to come here. 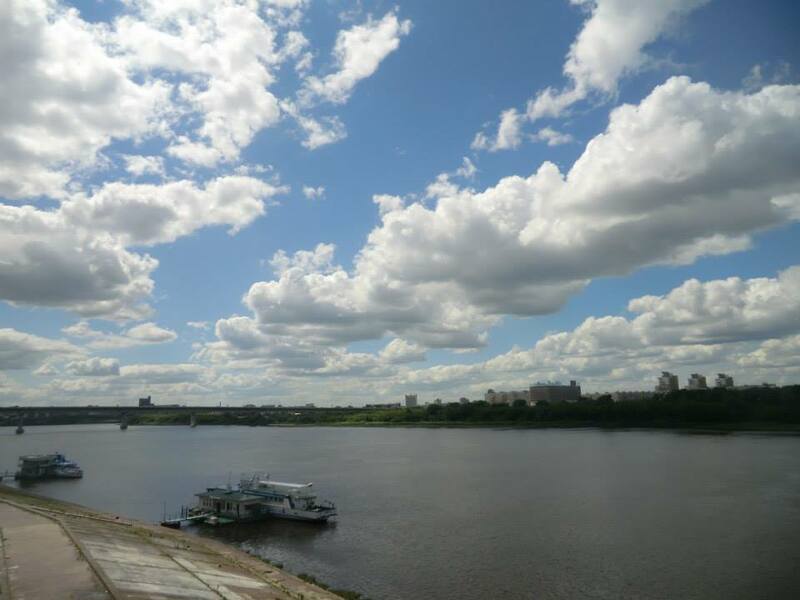 On Sunday I got up early in Nizhnii, got my things together, and walked to the metro station. I was heading back to Kazan. Back in Kazan--wow. Between 2002 and 2009, I came here almost every year. Indeed, this is where I spent some of my happiest moments in graduate school, both personally and research-wise. Kazan is also where I began writing the first draft of the dissertation that would, albeit with many changes, eventually become my book. It's one of the most important places in my personal geography. In some ways, Kazan has always reminded me a little bit of Montreal, the city where I attended university and another important location in my personal geography. In both cities, there's an obvious duality with respect to language, culture, and religion. 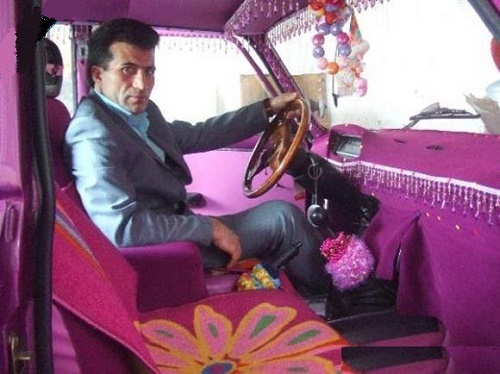 I remember taking "taxis" (really just cars that you'd stop back home in the middle of the night) and speeding down empty streets past a mosque, hearing the ezan (call to prayer) as the sun began to rise. Then we'd turn the corner and see a stunning Orthodox church. Kazan was also the place where I came into my own as a researcher. I arrived here for the first time in 2002 on a fellowship to start learning Tatar--this and subsequent trips helped to transform me from an historian of the Ottoman Empire and Turkey to one who worked on the Turkic world. Meanwhile, the types of materials that I was able to access in Kazan--including Russian-language documents from the imperial archive and handwritten Arabic-script Tatar-language materials such as letters and village histories--gave me the chance to look at Russian-Muslim interactions from multiple perspectives, rather than just relying on government-produced documents like most of the Russianists who've written books on Muslims in recent years. 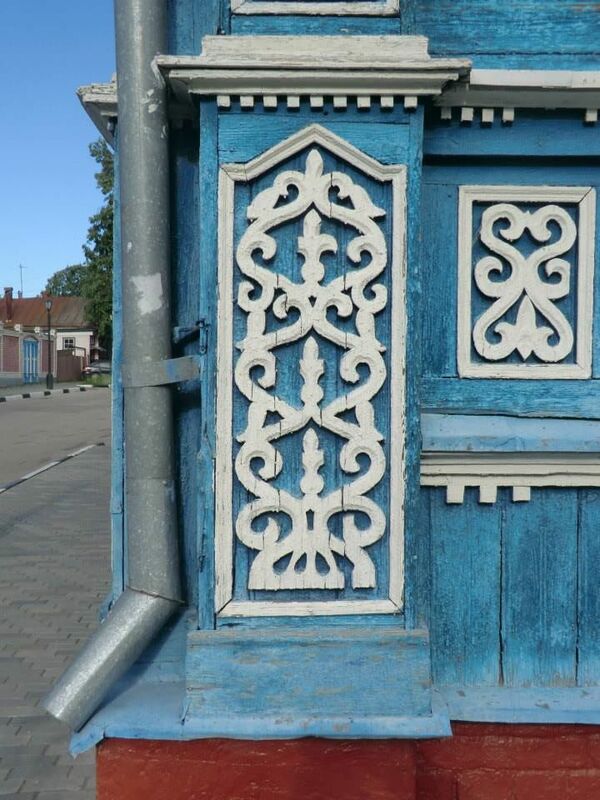 In short, my time in Kazan helped make my career exponentially more interesting than it otherwise would have been. 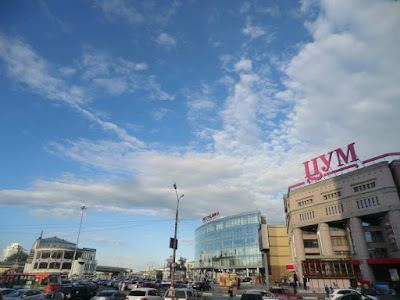 Leaving Nizhnii on Sunday morning, I took a six-hour bus ride to Kazan, then checked into my old standby--the Hotel Volga (motto: "Not as crappy as we used to be!") for one night. 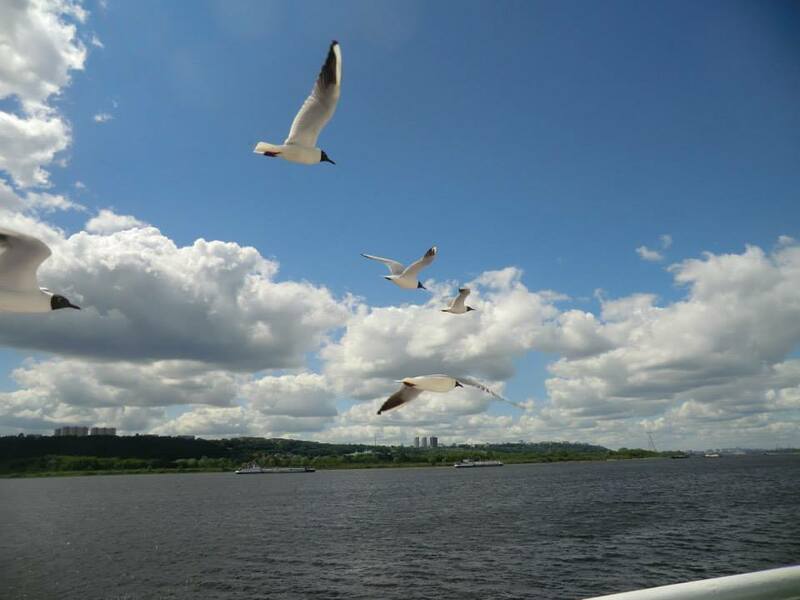 The next day I took a taxi from the Volga over to the AirBnB apartment where I'm renting a room. The apartment is just a couple of streets over from Tolstoy Street, where I spent most of the 2003-2004 academic year. The street is so named because Tolstoy studied Oriental Studies at Kazan University--Lenin studied at the university, too. I guess this is one of the few things that all three of us have in common. I've been spending most of the week in work-mode, spending time in the library and writing. I've also been reading some of the old handwritten materials that I'd long ago photographed, but which I've never gotten around to reading. Indeed, one of the goals of this trip has been to sharpen by paleography skills--as well as my spoken Russian--as I feel like both have atrophied to some extent in recent years as I've been doing more writing than research. 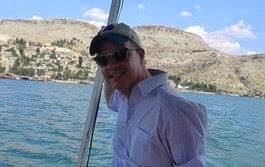 Mainly, though I guess this trip serves a purpose not unlike the month I spent traveling around Turkey last summer while my book manuscript was in the hands of the proofreader. As was the case then, I set up this trip because I wanted to re-connect with Russia a bit, remind myself of all the things that I liked about being here before I started graduate school. Have fun here again without stressing about completing a dissertation or book. Fortunately, that's an easy enough thing to do in both countries. Anyway, I've been putting up pictures of Kazan in an album in the Borderlands Lounge, so you can look there if you're interested in seeing more photos. So that's what has been going on in the JMB this past week. For now, though, I've got work to do and places to visit. More on that, however, in a post to come later on. 109 libraries can't be wrong! 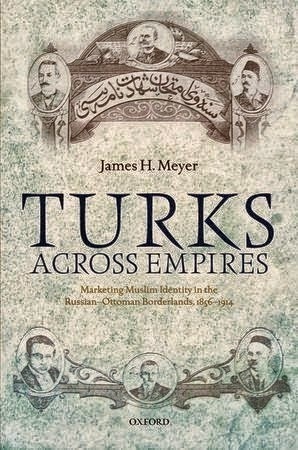 Get yours to order a copy of Turks Across Empires at the OUP website or from Amazon. More links, commentary and photographs available, как всегда, at the Borderlands Lounge.